Rita was born in a small village near Cascia, Italy, in 1381. Her parents had waited many years for a child, and they gave thanks to God for Rita’s birth. As a child, Rita often visited the nuns at the Augustinian convent in town and hoped to be able to join them one day. Rita’s parents had other plans for her. It was the custom in Rita’s time for parents to arrange marriages for their children. Rita put aside her own desires and was obedient to her parents. When she was 12, she married Paolo Mancini, the town watchman. They had two sons. Her husband did not treat her well, but Rita remained close to God through her busy days as a wife and mother. Two political groups in Cascia were always feuding. One day, Paolo got caught in the middle of a battle between the groups and was killed. Not long after, both of Rita’s sons died of an illness that swept through her village. Rita was now alone in the world. Her thoughts returned to her childhood dream of becoming a nun. 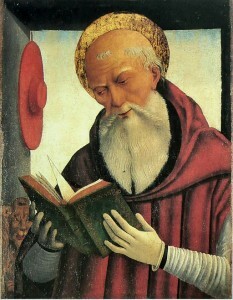 At first the Augustinian Sisters rejected Rita because she had been married, but in time, Rita’s prayers were answered. She was welcomed into religious life when she was 36 years old. Her days were filled with prayer and good works. 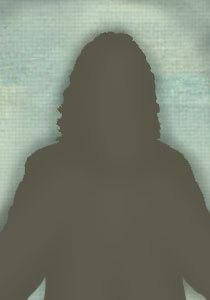 One day, about 20 years after she entered the convent, she was meditating on Christ’s Passion and crucifixion. As she prayed, a small wound appeared on her forehead. It looked like a mark from a thorn, like the crown of thorns Jesus wore. This mark remained on Rita’s forehead the rest of her life. It was a reminder of the great sacrifice Christ made out of love for all people. For several months before Rita died, she was unable to get out of bed. 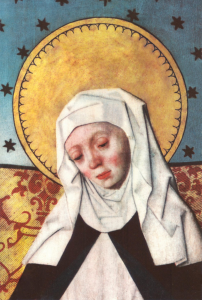 A legend about St. Rita tells us that a friend visited her and asked if there was anything she wanted. Rita said that she wanted a rose that was blooming in the yard of the house where she grew up. The friend knew that this was impossible. It was winter, and roses do not bloom in the snow. The woman left Rita and began to walk home, sad that she was not able to give Rita the one thing she had asked for. Along the way, the woman passed Rita’s childhood home. To her amazement, a single colorful rose was blooming on the branch of a rosebush. The woman picked the rose and hurried back to the convent to give it to Rita. It was as if God was rewarding Rita for all the thorns in her life with the miracle of the rose. You will sometimes see artwork of St. Rita holding roses. 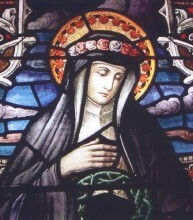 Rita of Cascia died in 1457 and was canonized in 1900. Along with St. Jude, she is the patron saint of impossible causes. St. Rita’s example reminds us to put our faith in God, who raised his only Son, Jesus, from the dead and promises us that we, too, will share everlasting life with him in heaven.